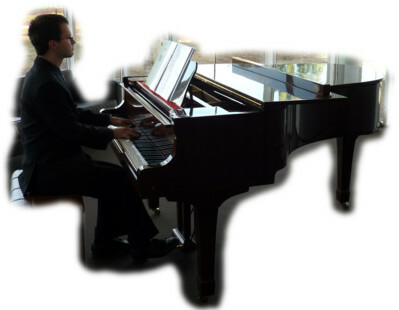 Derek Moule (AMusA) has extensive experience as a pianist and can provide piano music for weddings and receptions. Classically trained, though also comfortable with modern repertoire. Servicing Port Macquarie and surrounding areas. Reasonable rates and committed to performance of the highest standard. Derek is happy to provide a no-obligation quote for his performance, and is happy to discuss any special requirements / music you would like played at your wedding. A lot of time (and money!) often goes into planning a special wedding. Music can be very powerful in setting the tone of the occasion. Browsing the internet, there are many posts from people asking for suggestions of music suitable for weddings. Derek Moule is an experienced pianist and offers some advice for people trying to choose music for a wedding. He suggests searching for less commonly played music that was written specifically as wedding music. Many composers wrote fantastic wedding bridal entrances and postludes that are not played very often and so seem special and unique to your wedding, yet are designed for the occasion and so sound 'right'. CD recordings of popular songs, Wagner's Bridal March from 'Lohengrin' and Mendelssohn's Wedding March from 'Midsummer Night's Dream' are very common but played so often so might not seem as unique or special. As you listen to the music try to imagine if it would create the atmosphere that you would like while you walk down the aisle or depart from the ceremony. Having music performed 'live' at a wedding provides much better sound quality, is more special as it is really being performed for the wedding and eliminates problems caused by wrong tracks being used. If you would like to discuss music for your wedding, give Derek a call on 0404 431 022 or contact us. These are just a few suggestions. Don't feel limited by this list - Derek has a very large repertoire and music collection and is more than happy to discuss any other music you would like that is not included on this short list. To play the files, just click on the hyperlink. You will need to have a suitable media player configured to play MP3 files. If you experience problems, right click on the file you wish to download and choose 'save link as', or 'save target as' (or similar for your web browser) and save the file to your hard drive and try playing from there. If you still have problems, contact us. Other websites may link to this page but please DO NOT link directly to files on this website.